The diamond and engagement ring industries are changing. Thanks to shifts in economics, many young people are having a hard time coming up with the cash to buy a brand new ring before they propose. Instead, the idea of a heirloom ring being passed down is becoming far more common. But what if the heirloom ring isn’t exactly your bride’s style? Is it Appropriate to Customize an Heirloom? You may be surprised to find that many people actually support customizing an heirloom. Unless the original shape of the ring has some inherent meaning, it is usually the diamond itself that carries the family history with it. This means you don’t necessarily need to keep the same color metal or the same style of setting, so you can get the custom jewelry look while repurposing the stone at the center of the design. Custom engagement rings can be created using the basic materials of your heirloom ring. 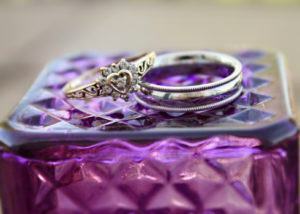 You should always ask the family member that is gifting the ring to you how they feel about you repurposing the ring. In some cases they may want you to keep the ring exactly the same as it was when they wore it, but your grandmother or favorite aunt may be on board with you updating the ring all around. Even if your family is not OK with you changing the fundamental properties of the ring itself, there are some other options. By adding a custom wedding band or enhancer you can update the look effectively while leaving the original ring untouched. This may be a suitable alternative that keeps everyone happy. Heirloom rings are becoming more and more prevalent, but many people are afraid to go too far when trying to customize the ring. The best practice is to sit down with your family and discuss the expectations for the ring as it is handed down. This will ensure that everyone feels like their wishes were respected when it comes to this important piece of family history. To learn more about getting a custom diamond ring from Dominion Jewelers, contact us today. We have jewelers available to customize your ring to your wishes and answer any of your questions.